Skittle was happy to have a little, squirmy playmate the other afternoon. I guess this is a baby garter snake. I don’t know my northern snakes very well, except that they are not poisonous. If this was Florida, that little snake would most likely be a pygmy rattler and my cat would now be dead. 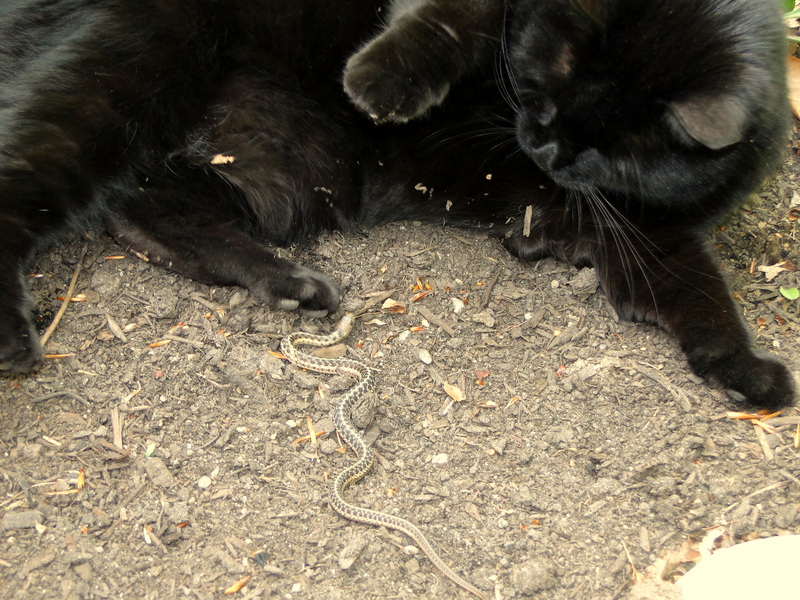 I wonder if cats can tell bad (deadly) snakes from good? She didn’t harm it. We saw the snake later out in the grass. That’s so cute. I love to watch cats. This cat constantly needs something to do. The snake kept her happy for about a half hour. She’s so cute. Did she let it live? Yes, she just wanted to have some fun.